Part of Lakewood’s success in recent years stems from its progressively designed city center, a large open-air shopping development called Lakewood Towne Center. The area has four components – a civic center with a city hall, a power center, an entertainment center, and a neighborhood center. Lakewood Towne Center’s high-profile anchor tenants include AMC Theaters, Barnes & Noble, Office Depot, Old Navy, and Gottschalks. Lakewood home for sale listings include choices up and down the entry level and luxury price scales for every type of buyer. Many of the city’s finest properties line the three lakes here – Lake Steilacoom, Gravelly Lake, and American Lake, and include a wide variety of comfort amenities. 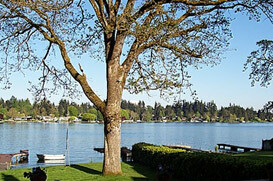 Lakewood real estate consist of luxury homes to Lakewood waterfront properties.